The time is perfect for material about walk-ins to be shared because the number of people having sudden transformations and walk-in experiences is increasing daily. Some walk-ins are off-planet beings (they have lived in other star/planetary systems/dimensions) who are taking a human form for the first time, or the first time in a long time. These “new” souls need some basic understanding of the process in order to acclimate and get on with accomplishing the purpose for which they came to this planet–to shine light upon the human condition. The general consensus is that walk-in souls are evolved enough to have energy or information to share with an awakening consciousness; therefore, they can avoid the birth and childhood process. Walk-ins are not better than any other soul on Earth, so there is no need to get caught up in the drama of that idea. In fact, the life of a walk-in is difficult, and many times lonely, because there are not many people they can talk to about their experience. Request to be added to the closed Walk-ins Among Us Facebook group if you would like to share your experience and interact in the private discussions. Because we are all multidimensional beings, everyone here on Earth is from someplace else. We are all here to do something, regardless of how or when we came to be in a human body. This book will help lightworkers, healers, starseeds, and indigos discover their mission and move toward making it a reality. Whenever I mention the word “walk-in” (which I do not do with just anyone), I get a mixed response. Some are fascinated by the concept, some think I am downright crazy, and others give me a dropped-jaw, deer-in-the-headlights look. When that happens, I know a light bulb has just gone on in their heads, and it has “Ah-Ha!” written all over it. Every person on Earth has a personal journey to follow through the process of ascension. Like other lightworkers, walk-ins are path-cutters or way-showers who have agreed to incarnate in order to heal, clear and release cellular patterns recorded in human DNA and the planetary grid. Many of us feel like misfits because we have the ability to operate in the multi-dimensional reality of our upper chakras, whereas most residents of this plane are operating only in the lower three energy centers. As forerunners of the oneness evolution, we see the cosmic picture and awaken others by leading the way—many times through mystical experiences. We tend to get “star-being syndrome” when we see the ideal of how humans are supposed to function and then feel frustrated when others are seemly hypnotized and stuck in their unenlightened programming. I remember being called a “trailblazer” in a prophecy given over me by Mickey Robinson in the late 1990s. Although I have always been ahead of the pack when it comes to spiritual phenomena, this prophecy makes more sense to me now than it did back then. It helps me understand why my gifts were rejected by the church and why I have had such a problem with authority figures all my life. I have always been a rebel when it comes to adhering to social norms and this is part of the dismantling of old structures that dictate how we sustain our existence, do intimate relationships, and interact globally. We are assisting the plan of oneness by allowing our bodies to receive subatomic biological changes that will move all of us into a silica- or crystal-based form known as the light body. This process has been occurring for quite some time but has recently sped up as we entered the Age of Aquarius. We are experiencing a cosmic convergence of starseeds, celestial beings, and walk-ins now arriving on Earth to connect with those already in body, who have paved the way. These advanced visitors are our future selves from other universes and planes of existence. You could be one of them. It is best that you determine for yourself whether or not you have had a walk-in experience. I support you in discovering your own truth and not just believing what someone else says about you. The purpose of this book is to help walk-ins move past the adjustment period and step into service as the empowered being that they are. Walk-ins Among Us provides the help you will need if you experience a significant spiritual transformation in which you suddenly change many aspects of your life. Trying to acclimate to the faster vibrational energy from your oversoul, soul group, or multidimensional aspect of yourself can be daunting. This book is intended to help you feel safe and get connected with other walk-ins. This article was excerpted from Walk-ins Among Us ~ Open Your Personal Portal to Cosmic Awareness written by Yvonne Perry. Yvonne offers coaching and energy sessions to help with the walk-in or soul exchange process. Can a Walk-in Release the Inner Child? Can anyone release their inner child? The answer is both yes, and no. We can heal the wounded or misinformed inner child and release it from much of its suffering, but we cannot make it leave the body, nor would we want to. The inner child is part of the psyche/ego, without which there is no free will or choice. Part of the reason for being incarnated to experience enough “pressure” on the soul to help it expand into new levels of consciousness. The seemingly “negative” experiences we have on this Earth plane are created to exercise our spiritual muscles and that help us move forward on our return to oneness with Source. Someone recently asked me about being a walk-in and releasing the inner child of the former soul. I felt led to share what I wrote to that person because it applies to all of us. “What you are actually working with are the cellular memories and residual energy of the conditioning and experiences the former soul had while in body. Those core issues are part of the psyche/ego that you have inherited, and this will continue to influence you as long as it is not healed. Once it is sufficiently dealt with, the triggers that cause relapse are lessened and you will be able to offer healing to others who have similar needs in that area. “As a walk-in, you have accepted the mission to heal this wounded aspect of the human experience and transform the suffering left by the walk-out soul. And then to radiate that healing outward to all humanity. It’s no easy job, and many who come here to help get sucked into the illusion, forgetting who they are as empowered light beings. What you hear in your head and feel in your emotions is not always real—many times we pick up on the human collective conscious crying out for help, or we sense the frequencies of the torment being projected into the planetary field. “We are here to transmute the negativity of the dark and chaotic energy of the Earth matrix that is causing terrible suffering in humanity. We have the ability to reprogram the misinformed mind/psyche so it learns to respond more positively to outer stimuli. This is an “inside” job that means we must diligently maintain the vibration of the higher realms from whence we came. I recommend doing inner child work to re-parent the inner child/wounded ego so it no longer gets to “drive the bus” so to speak. “Being mindfully present in every moment is the key to accomplishing this. It means paying attention at all times without offering any judgement or commentary. Feel your body, listen to every sound you hear, notice every physical sensation, be aware of what you see, taste your food, and simply be aware. Pausing before reacting, and dropping into your awareness, gives you a chance to discern guidance from higher realms. You will then be able to wisely determine your best response in any situation. The energy we give out in any situation either anchors more light in the world or reinforces the negativity we came here to dispel. The more we practice, the easier it gets. We can all do this, so let’s encourage one another with some comments here. A walk-in is a soul that has walked into an adult body rather than the body of an infant. The natal soul—the one that entered the body at the infant stage—normally walks out at the same time that a new soul walks in. The experience known as a walk-in is becoming more common. Unlike the possession that occurs when an Earthbound entity forces its way in uninvited, this exchange of souls is done with permission, and there are no hostile takeovers. Learn more about walk-ins. Fortunately, today’s swapping and merging of soul essences is not the “trial-and-error” cosmic experiment that it seemed to be for many of us “forerunners” in the 1980s and ’90s, when an increase in soul exchanges started being noticed. There is now a collaborative effort and better communication between those of us in body and those galactic beings who are helping to facilitate the integration process, which is joining our multidimensional selves into a cohesive expression of oneness. Soul exchanges today are more gradual, occurring over the span of many years rather than the “in one day and out the next” scenario some people had a few decades ago. Why Are Walk-ins Becoming More Common Now? Our galactic alignment exposes us and the Earth to the influences of other planets. These cosmic rays introduce multidimensional energy that begins to shift the body to hold universal frequencies of higher octaves. This is having a genetic effect upon humans. It is restoring the blueprint of the 12-strand DNA model that was modified eons ago. This modification cut us off from our multi-dimensional awareness and created duality (right/wrong, good/bad, male/female), causing us to live in the illusion of separation. Our counterparts are walking in and integrating as one expression. We are constantly receiving information through our skin—the largest organ of our body—but we are conditioned to believe that if we cannot see, hear, taste, smell, or touch something, then it does not exist. Yet, we know that discerning abilities exist even beyond our intuition. We are constantly receiving information through the sensory receptors of our skin, which in our divine form was originally part of our autonomic system. These sensors went offline because we stopped using them. Animals know when a tsunami is coming, and they get to the highest hill while humans, who ignore their higher guidance, stay in the danger zone until it is too late and they get washed away. Humans have never been comfortable with things they cannot explain. Many are not able to accept supernatural occurrences and ideas because their filters of what is possible prevent them from believing in something outside of the socially-accepted norm. They fear rejection from those who lack understanding regarding the multifaceted soul; they do not know that we are spirit having a human experience. That is why many people do not talk about such things as near-death experiences, seeing ghosts, or being taken aboard a spacecraft. Fortunately, people have begun to open up and report what has personally happened to them; and thanks to mainstream media (although distorted), the belief in an afterlife, communication with the deceased, and interaction with our galactic family is gaining acceptance in American culture. Prior to the 1970s, no one had heard of a near-death experience (NDE) and the term was not even in our vernacular. We were just getting accustomed to that phenomenon when we started hearing about walk-ins or soul exchanges. And, here I am embracing the very real experience of working with our galactic family to help raise the vibration of Earth and the consciousness of humanity. Some readers may find these concepts a bit far-fetched. But, bear with me and let’s see if I can shed enough logic on the topic to help you open to something bigger than the view you currently have of yourself and the life you are now experiencing. An idea gains validity when enough people talk about it in a way that makes it “safe” to accept. The knowledge that some souls walk into an adult body rather than being born into an infant body is a new concept to many people. It is probably not something you have discussed at the dinner table with your in-laws. However, people have been reporting these occurrences for many decades, especially since the harmonic convergence on August 16 and 17, 1987—the world’s first globally synchronized meditation, announced by José Argüelles. Once people know what a walk-in experience is and enough walk-ins overcome the confusion that sometimes takes place when a soul exchange occurs, society will see this as a common experience. Why is this important? Because soon after a walk-in occurs, the person involved usually begins to experience or create huge lifestyle modifications. They need support. Maxine Taylor began her astrological studies in 1966. In 1968, she became Georgia’s first licensed astrologer. In 1970, she got astrology legalized in Atlanta, and spearheaded the establishment of the Atlanta Board of Astrology Examiners. In her book, Earthbound, Maxine Taylor states: “The combination of the cell memory of the walk-out and the advanced psychic ability and knowledge of the walk-in can be confusing and frustrating. But, ultimately, these energies balance and you will be able to express your mission.” Maxine’s passion is working with walk-ins and helping them understand their walk-out and walk-in lives by understanding their natal and walk-in charts. At first, walk-ins may feel differently about their family members and friends. They may change jobs, redecorate their homes, or relocate. Even the style of clothes they wear may change drastically. In some cases, these shifts in feelings are gradual and relatively subtle. But for others, the shifts may be immediate and dramatic. If the person is not aware that a soul exchange is occurring, the experience can be very disorienting. Having people understand and accept the phenomena is part of the integration process that restores wholeness to the individual. Thus, books like Walk-ins among Us are intended to bring knowledge of soul exchanges into the mainstream consciousness and help walk-in souls move forward and begin to offer the healing gifts they have brought with them. This article was excerpted from Walk-ins Among Us ~ Open Your Personal Portal to Cosmic Awareness, written by Yvonne Perry. If you need help integrating a life-transforming event, you may want to request a free 15-minute evaluation chat with Yvonne. 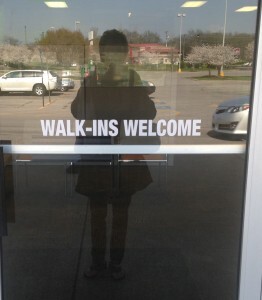 I chuckle whenever I see a sign that reads “Walk-ins Welcome.” It is so nice of businesses to extend an invitation to the star beings who come to Earth in a less traditional manner. They must know that some souls skip the baby, toddler, and young teen years and take up residence in a mature human body. I am sure that is what the signs indicate, right? When a soul’s work is complete it may be offered the opportunity of soul exchange without having the body die. Even if the natal soul’s work is not complete, the incoming soul may still make the exchange by agreeing to complete any unresolved issues for the soul it is replacing. These exchanges are much like a hospice transition or a physical death. Do you think you are having a soul exchange or walk-in experience? Here are some tips on how to prepare when someone is about to experience a conscious soul exchange. Most conscious walk-outs communicate with the walk-in soul for weeks or months prior to the actual swap date. The walk-out soul should make sure that the walk-in soul is of the light and is not going to harm the body or anyone else. The best way to is to simply ask internal questions and use the “The Feelings Test” in Chapter 7 of Yvonne Perry’s book, Walk-ins Among Us, to notice vibrational shifts in your body when considering the decision. Allow the outgoing soul to enjoy a favorite food, visit a favorite place, or do whatever brings a sense of closure or completion before departing. Nourish the body well to make the vessel as clean and healthy as possible. If the departing soul is troubled, overly tired, or in any way emotionally charged, it is highly recommended to retrieve soul parts. Clean and clear past karma of departing soul to help “get the house in order.” The departing soul may need to be forgiven or offer forgiveness to another person. They may ask that this be done on their behalf if they feel unable to do so before leaving. The departing soul should disclose whatever needs to be taken care of and know that someone will complete any unfinished business in his/her absence. Set the “nest” with clear and high-frequency energies like one might for a physical birthing: a quiet, peaceful, and loving environment without intrusions so the body can simply lay down and go through the cord exchange. The soul needs to know that it is loved. Give thanks for the work it accomplished while in body. If a soul exchange is in the highest and divine order, it will take place when the two souls are ready to swap places. You can not force this to happen. By setting the stage as described above, you are letting your guidance team know you are willing for the exchange to take place. On the best of days, life is complicated. Now, imagine one day you wake up in a body not your own; in a place not your home and you may not even realize this has happened. All you know is that you don’t feel like yourself and you don’t feel like you’re home. In Walk-Ins Among Us, Yvonne Perry does an admirable job of introducing us to such a phenomenon. A complicated subject is addressed with a focus on kindness to the self. Through various references, resources and techniques, Perry takes us into a world that some might view as science fiction, yet might answer many questions for many people. “An idea gains validity when enough people talk about it in a way that makes it safe to accept.” This is true of any idea. Unless we feel safe to explore our lives and a myriad of possibilities, we leave ourselves potentially missing something that might easily guide us along the path. Whether you are a walk-in or not, being able to venture down this road with the author will allow you to consider possibilities beyond what can be seen or touched. Yvonne Perry shares her enthusiasm for the subject as well as personal experience. She sites other experts in the field and you are given enough references to do your own research should you wish. In spite of the focused subject, Perry’s suggestions are valid in any walk of life. In this book you will learn ways to determine the difference between feelings and emotions. You’ll discover ways to make honest and true-to-self decisions. Now add the offering of kindness to self during times of spiritual growth and anyone can glean something of value. If you were to wake up a stranger in a strange land, wouldn’t you want a kind heart to show you where to start? Yvonne offers that kindness as she gently points the way for others who have experienced her journey. “There are many variations of walk-ins and soul exchanges, so do not get caught up in labeling your experience.” All too often, we identify with whichever label we’ve been given or adopted. That in itself is limiting and Perry guides the reader toward more expansive understandings. Regardless of your belief system, the author provides the open-minded reader with insights and guidance that will help any spiritual journeyman and if you are a walk-in, you’ll find a kindred soul to welcome you to your new life. The article below was excerpted from Walk-ins Among Us ~ Open Your Personal Portal to Cosmic Awareness written by Yvonne Perry. After the exchange has occurred, it is important to continue to maintain a safe place for the soul to safely experience the energy of higher dimensions. Often a greater realization is given to that person as he or she is in the presence of multi-/omni-dimensional beings in a higher field. In the earlier stages, a walk-in may have recognition of other-worldly or other natures such as elementals—whatever is the nature of the incoming soul at the time or phase of integration. All seems to become unified as integration continues. It is common for the body’s need for sleep/rest to change after a walk-in. Some nights and days will be highly activated with so much light and energy that you may be unable to sleep. Other times, you may sleep for twelve to fourteen hours straight. The need for extra sleep may last for days, weeks, or several months; so, give your body the time it needs to fully adjust. Eat to “fuel the situation” and forget whatever the latest diet or eating trend might be. Listen to your own body. Getting together with other walk-ins/highly-evolving beings can be beneficial to help hold the field of energy steady. The new soul may go through the “am I going crazy?” or “what is happening to me?” stage and need to share what is occurring. You may want to socialize with this Facebook group of walk-ins. Continue cleansing the vehicle (physical body) and lifting the vibration using products that support the higher electrical current. These include living or raw foods, organic fruits and vegetables, unrefined grains, non-GMO and non-chemically treated foods, non-flouridated water, etc. Breathing techniques, yoga, stretching, meditations, and adequate rest are all helpful to help the body shift and match frequencies along the way. Much like shifting gears on a car, coming to a neutral point is very much a part of the integration process. The soul needs permission to do nothing more than follow the guidance as it comes in. We do not have to know everything that is transpiring; we do not have to be in control; there’s no need to focus on the work of the new soul until everything is integrated and functioning well. Sometimes a soul wants to hit the ground running. In these cases, the task becomes one of stabilizing and not moving too quickly before making a good assessment of the appropriate way to proceed. Keep life simple and acquire only what is truly necessary in the moment. Yvonne Perry offers coaching and energy sessions to help with the walk-in or soul exchange integration process. Let nature support you in the integration process. A friend taught me the following technique. It was very warm that September day as we were sitting at a picnic table in a park. Cicadas were buzzing all around us and seemed to respond to whatever she was saying as she demonstrated being at one with nature. When I put my thumb and first finger together and spoke, “I intend harmony in this space now,” the cicadas humming noise increased by at least 100 percent and the wind kicked up. As I went about exploring my surroundings, the cicadas would calm back down to a low buzz. I thought it was just a coincidence at first so I tried it again (and again and again) just to see if it could be reproduced. I was amazed at how nature responded to my intention every time. Could You Be a Walk-in? Many people come to me for coaching wondering whether or not they have had a soul exchange or walk-in. These are the questions I ask to help them determine truth for themselves. The first soul to reside in my body knew it was in for a hard trip—it seems that part of the plan was to make sure her life experiences would carry her through an emotional meat grinder. With multiple surgeries, illnesses, and injuries, the physical body got pretty banged up as well. Thankfully, there was a backup plan—a soul exchange would occur when the ride got too rough and the natal soul wanted off the merry-go-round. It was agreed that another soul would step in when the natal soul reached a point in which she gave up on life. A two-year period of depression indicated that she was ready to leave and accept a soul exchange. When I was receiving energy work from Roni Angel (Doctor of Psychology and creator of CHORD Therapy), I gave her a copy of my first book, Email Episodes ~ A Hilariously Honest Look at Life. She immediately recognized that I was a walk-in, but she did not mention it to me right away. (We walk-ins tend to recognize one another.) As Roni and I were talking, she shared her personal walk-in story. My mouth dropped open, I felt like I was going to burst into tears, and I could hardly speak. I asked her if she thought I might be a walk-in, and she said that I had many indications to suggest that probability. I had never heard of such a thing as a walk-in. I had many times thought that I had died and come back alive in the same body. After that revelation, I began to process the karmic imprint of the old soul, and clear away the “brain damage” of the first forty years of my very religious life. That is when my writing career took wings. Soon, I began to step into my new role as an author and teacher, and later as a coach for empaths and walk-ins. Some individuals who come to me for coaching think they may be a walk-in, but are not sure. While there is no proof other than what your own heart tells you, there are some similarities that seem to indicate such an experience. I have a passion for walk-ins and coaching and energy sessions to help with the walk-in or soul exchange process. Are you a walk-in? Was that strange experience you had actually a soul exchange? An abrupt change in personality that may have resulted from a dissociative event, near-death experience, suicide attempt, or other perilous marker. Feeling like your body has been short circuited or that your nerves have been fried. Brain fog or sudden loss of memory. Having a sense that you are a misfit on Earth. This feeling may have intensified when the two souls swapped places. Suddenly having chronic fatigue and muscle pain such as fibromyalgia. For me, this started with the actual event that pinned me to the floor, and lasted for more than two years afterward. Spiritual gifts suddenly opening up: You start to know things about people that no one has told you. You suddenly start to see, hear, or feel non-physical beings around you. You become more telepathic. Your sensitivity to energy increases. You touch someone and they are healed. Could you be a walk-in? Take a moment to write down your answers on another sheet of paper. It can help you determine if and when you walked into the body you are now in. Knowing the date will be very important when you have your walk-in astrology chart done. Maxine Taylor, who specializes in reading charts for walk-ins, can help you with this. Maxine is CNN’s former on-air astrologer, a national speaker, and a co-founder of the Atlanta Astrological Society, the Atlanta Board of Astrology Examiners and the Atlanta Institute of Metaphysics. She currently serves on the Board of Directors of the American Federation of Astrologers. When you first had a spiritually-transforming experience, what emotional or physical changes did you notice about yourself? What was different about your thinking patterns? Was there a thought or phrase that was repeated? Did your body seem strange or new, as if it did not belong to you? What were the circumstances of your life just prior to the event that caused you to suspect that you are a walk-in? Did you have a lapse of memory regarding your childhood? Were there significant life alterations, such as career changes, a miraculous physical healing, an urge to end a relationship, dress differently, redecorate, or relocate? Was there a shift in your beliefs and life values after this significant event? If you have had more than one walk-in experience were there common signs that you now recognize that indicated you were about to shift? Did you notice a change in your spirit guides or your ability to receive spiritual guidance? What has been the most challenging thing about integrating the higher vibrating energy of your walk-in soul? This does not work for everyone, but there has been a lot of research showing the validity of muscle testing. You can use this test whenever you have a spiritual question and you need a true or false answer. Kinesiology also helps us with selecting the food and supplements we need to support our bodies. Before doing this exercise, it is important to center your energy and come to a still point inside your personal space. Take a few deep breaths and sense whatever is going on for you at that moment—feel the seat you are sitting on, notice the smells and sounds around you, the feelings in your body. See/feel yourself letting go and dropping any energy that does not belong to you. Then, call your own energy back from wherever it might have wandered, passing it through the ultraviolet flame of transmutation as it returns to your field/body. This can help bring you into the now moment or still point where you are ready to hear from your higher self. Now, with your index finger and thumb on each hand, form a circle. Connect the finger circles together like links on a chain and pull tight. The resistance you feel should be strong. Make a false statement, such as “My name is Elmer Fudd” and try to pull the links apart. Now, unless your name really is Elmer Fudd, that connection probably weakened and you were able to pull the circles apart quite easily. Your muscles will typically weaken in response to a false statement. Now, reconnect the finger circles and state your real name: “My name is _______________.” Most likely your link stayed strong. This indicates that your body perceives this as a true statement. Next, state to yourself, “I am a walk-in,” and try to pull the finger circles apart. If you are a walk-in, your body perceives this statement as true and you probably were not able to break the link. If you are not a walk-in, then you will probably be able to break the connection very easily. Here is a method of muscle testing demonstrated using pinky finger and thumb. This can be used for anything that you would like to get a yes or no answer. Feel free to share the results of your tests on our Facebook page: http://www.facebook.com/WalkInEvolution. 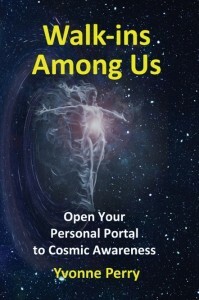 This article was excerpted from Walk-ins Among Us ~ Open Your Personal Portal to Cosmic Awareness written by Yvonne Perry.